So much science goes into stopping a vehicle. There's physics (momentum, inertia, friction) and mechanical engineering (fluid mechanics, simple and complex machines). Here we'll explain components commonly found in the brake system of passenger vehicles, without getting too granular about ALL the science involved. *Brake fluid. 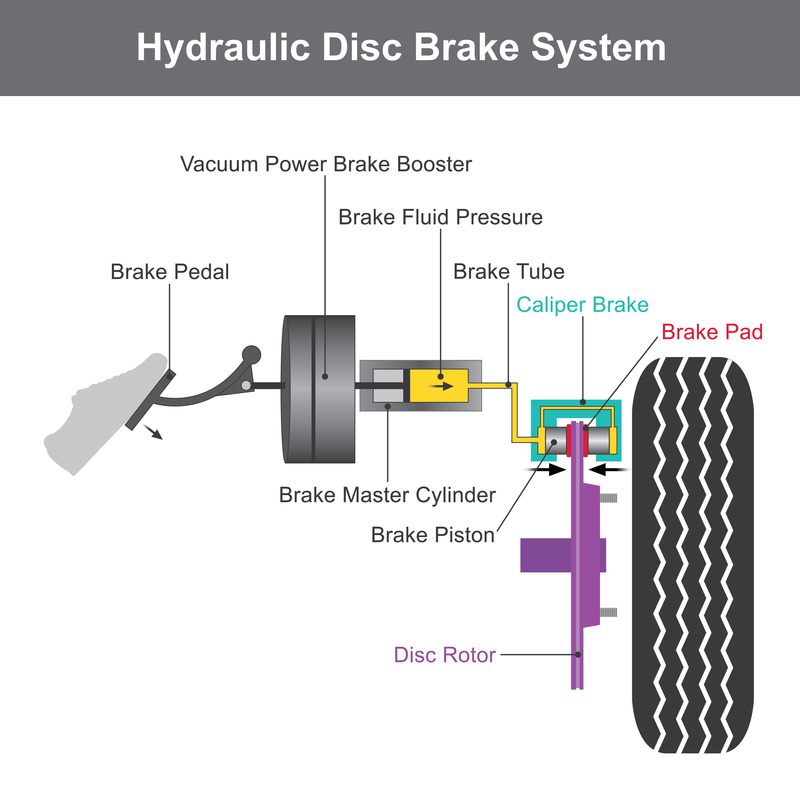 Stopping a car depends on hydraulics, and brake fluid is literally the system’s lifeblood. Pushing the pedal forces fluid through the lines, causing components to expand against the wheels, stopping the vehicle. How often your brake fluid needs to be replaced depends on a number of factors, such as your driving habits and environmental variables like heat and humidity. Most vehicles don’t offer gauges or sensors to track brake fluid. So having your fluid inspected by a certified auto mechanic is crucial. “Brake fluid is the most important fluid in a car and probably the most ignored,” said Tony Molla, vice president of the Automotive Service Association. *Brake pads. Made from a variety of metals, brake pads squeeze the rotor whenever the brake pedal is pushed. Brake pads typically last between 20,000 and 40,000 miles, perhaps much longer with high quality brake pads. But even if you aren’t watching the odometer closely, brake pads are designed to alert drivers when they’re wearing thin. A small metal piece pings or “chirps” when it makes contact against the brake disc. Warning: Listen for that squealing, otherwise you could do serious damage to your brakes. Paying attention to and acting on cues like these help keep routine services from mutating into major repairs. *Calipers. Part of a disc brake system, calipers push the brake pads against the rotors when the brake pedal is pushed. This resulting friction between the pads and rotors slows--and ultimately stops--the vehicle. Waiting too long to replace worn brake rotors puts extra stress on the calipers. The calipers will rub against uneven rotors if the components aren’t parallel to one another, creating a vibration that can be felt in the steering wheel during stops. *Drums. These bowl-shaped components use springs to expand the brake pads against the inside of the drum. This style of brakes is typically found on the rear of trucks or sedans. While it produces brake dust, the majority of it hides behind the covering, which means less gunk on your rims. The brake drum is typically made of cast iron that conducts heat and is resistant to wear. So why are drum brakes usually found on the rear wheels? *Rotors. As the name implies, these metallic discs rotate as the wheels are in motion. Rotors sit behind the wheel assembly and can sometimes be seen through the vehicle’s rims. Pressing the brake pedal activates clamps on both sides of the rotor. Friction created during braking produces searing heat that eventually scars the rotors. While they can be resurfaced, rotors eventually reach a point where replacement is the only option.